We’re excited for March – not only because it signals the end of winter but because HMF will be back in full swing with four O’races, including a brand new one in Southington! There are also two challenges to choose from that will up your ante on bringing the big bling home. In 8 short weeks, we’ll be ready to make your winter training worth every see-your-breath, don’t-feel-your-toes-until-mile 2 moment. The NEW O’Shenanigans race in Southington and Cheshire won’t disappoint. A serene flat and fast 5K along the Farmington Canal Heritage Trail and surrounding roads will be topped off with a brewery party at the hip new Kinsmen Brewing Company. Celebrate your finish with handcrafted beer, munchies and a sparkly medal. Each O’race will feature different swag, with event medals that will join together to form a glittery green three-or four-leaf clover if you join the Trinity or Lucky Challenges, respectively. Just register for your choice of O’races by February 27 and we’ll reward you with the magic middle piece to connect your clover medals together (provided at the last of your 3 or 4 races in Niantic or Hartford). If you take the 4-race Lucky Challenge, you’ll also earn a custom series pint glass, pick it up in Hartford after the race. Note - register for each event individually. Earn your first O’race medal and a festive and versatile seamless bandana, great for a face-warmer, neck gaiter, headband or hoorag. Get in on the inaugural race from Southington through Cheshire with a kickin’ post-race party at the brand new Kinsmen Brewing Company with food by Sauced. The beautiful northeast corner of the state is the backdrop for the 2nd race in the series. Earn a newly designed, signature Irish O’beanie hat and your second chance at a sparkly medal. Enjoy a mouth-watering corned beef sandwich on a pretzel roll from Courthouse Bar & Grille – washed down with an ice cold brew. Head down to this quaint shoreline community for another flat and fast course. 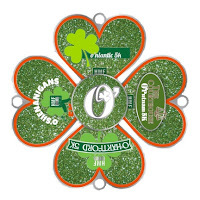 You’ll earn a pair of screaming Irish green knit running gloves and the third opportunity for a clover medal. Note, if O’Niantic is your third and final race of the Trinity series, you’ll pick up the middle piece for your clover after the race. With start and finish in Bushnell Park, the biggest O’race is better than ever. We’re in the works on creating a craft beer event post-race party to cap off the St. Paddy’s Day race festivities. Earn the last of the glittery green medals and custom knit running socks covered in green shamrocks. Pick up the middle piece for your clover after the race along with the custom Lucky Challenge pint glass (for those that ran all four O’races only).